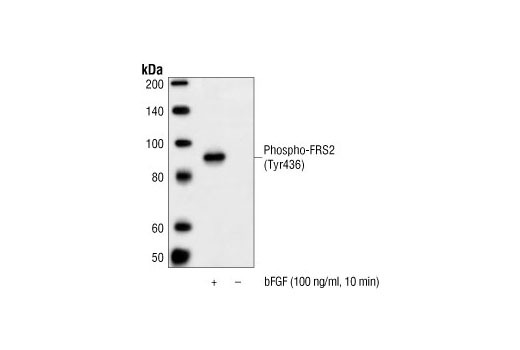 Western blot analysis of extracts from NIH/3T3 cells, untreated or bFGF-stimulated (100 ng/ml for 10 minutes), using Phospho-FRS-2 alpha (Tyr436) Antibody. The human bFGF coding cDNA was obtained from human bone marrow cell mRNA, subcloned into a prokaryotic expression vector and expressed in E. coli. The recombinant human bFGF protein was purified and stored in PBS buffer containing 0.1%BSA. The EC50 for stimulation of Balb/c 3T3 cell proliferation is 0.1-0.2 ng/ml. Basic fibroblast growth factor (bFGF) is supplied as a solution. It should be stored at –80°C. Aliquot the reagent upon receipt and avoid repeated freeze-thaw cycles.